You can purchase a twin full mattress bag to pack your mattress so that it is not damaged at all during your move. Our twin/full mattress bag will, as its name suggests, fit any twin or full-sized mattress and keep it safe from any sources of staining or tearing. When you move a mattress without any protection, you are exposing it to any seasonal elements like rain or snow along with whatever else is in your chosen moving vehicle. Any truck you rent, regardless of how clean, will still likely have some dirt, dust, or grime that may rub against your mattress, and your other possessions may be dirty or have sharp edges to rip the mattress with. 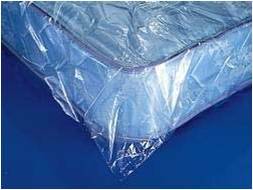 By placing your mattress in our bag, however, you will be able to rest assured that it is being protected, as our mattress bags are made from thick plastic that is difficult to break through. Oftentimes, people will save the bag that their mattress originally came in and use that, but it is likely to have gathered dust and may not be as strong as the mattress bags that we have to offer. Some people don’t even take their mattress into consideration until they go to load it into their chosen vehicle and realize how helpful it would be to have something to protect the mattress. By ordering a mattress bag from us, though, you will be prepared and able to maintain your mattress’ clean and unscathed condition. Having a mattress bag also makes loading and unloading your mattress easier, as the bag offers a more stable grip. While not required in order to purchase any of our packing supplies, we always recommend that you allow our certified movers to handle your move so that they can use their training to ensure that your mattress is not dropped, preventing damage to both the mattress and yourself.